The head of Iran’s Atomic Energy Organization says the interim deal does not impose restrictions on nuclear research. The head of Iran’s Atomic Energy Organization said on Wednesday that the country’s nuclear deal with world powers does not impose any restrictions on nuclear research. Speaking to Press TV, Ali Akbar Salehi reiterated previous declarations that Iran is developing a “new generation” of centrifuges. “The best part of this joint action plan is the research part. 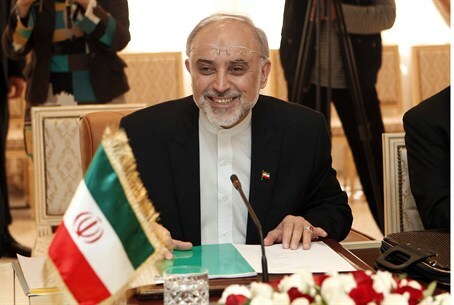 It’s so clear that R&D has no constraint,” Salehi said, speaking of the interim nuclear deal struck between Iran and the six world powers last November. The deal took effect on January 20. “We have a number of advanced centrifuges, which are under the IAEA (International Atomic Energy Agency) supervision where they are being tested and uranium gas has been injected into it – of course, not for accumulation, it’s just for testing those centrifuges,” he said. Salehi said centrifuges will have to run for “probably two years” before making sure that they “are performing well enough” to start mass production. He dismissed allegations by American officials that the deal managed to dismantle half of the centrifuges running in Iran. “Out of the 18,000 centrifuges that we have roughly, 9,000 of them are working, are functioning; and the other 9,000 we have voluntarily accepted not to inject gas into them,” he told Press TV. Even after the interim deal was reached, Iran has consistently said that it will not stop its nuclear program, which it claims is for peaceful purposes. Several weeks ago, Iranian Foreign Minister Mohammad Javad Zarif denied that his country had agreed to dismantle its centrifuges as part of the nuclear agreement. Zarif insisted that the Obama administration was mischaracterizing the concessions by Iran in the six-month nuclear deal, saying that "we did not agree to dismantle anything." Iranian President Hassan Rouhani recently declared that his country will not dismantle its nuclear facilities. Rouhani said nuclear weapons had no place in Iran’s defense strategy but also made clear that Tehran was determined to maintain a uranium enrichment program for peaceful purposes. Despite these declarations, the U.S. and the European Union recently lifted some of the sanctions that were imposed on Iran in recent years, as the West had agreed to do as part of the interim deal. Iran and the six world powers will resume talks in New York later this month on reaching a long-term nuclear deal.